Muong Thanh Quang Ninh Hotel is the luxury hotel in Ha Long City. This is one of the hotel belongs to Muong Thanh Group. 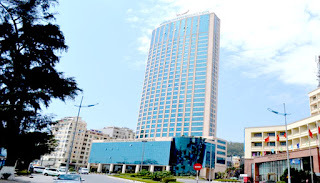 The hotel locates in the ideal location that leads you conveniently to the destinations of the city such as Ha Long Night Market, the beach, the city amusement park and the wharf. From hotel to Tuan Chau Island: 15 km. Minh Chau Lobby Lounge, Ha Mia Bar, Thien Cung Restaurant, Van Xuan Restaurant, Conference Rooms, etc. Total of room: 508 rooms in which there are 6 room types. They are deluxe room, grand deluxe, junior suite, executive suite, grand suite and presidentialsuite. Room features: wooden furniture, internet in room, daily English newspaper, mini-bar, bathtub and some other features that offered by the room type specifically.